Tap Tales – How rich can YOU get in this Idle Clicker game? Have you been searching all your life for a way to become a Millionaire? Billionaire? How about being a Trillionaire… Nah, how about Quadrillionaire! Ok, ok… forget that! 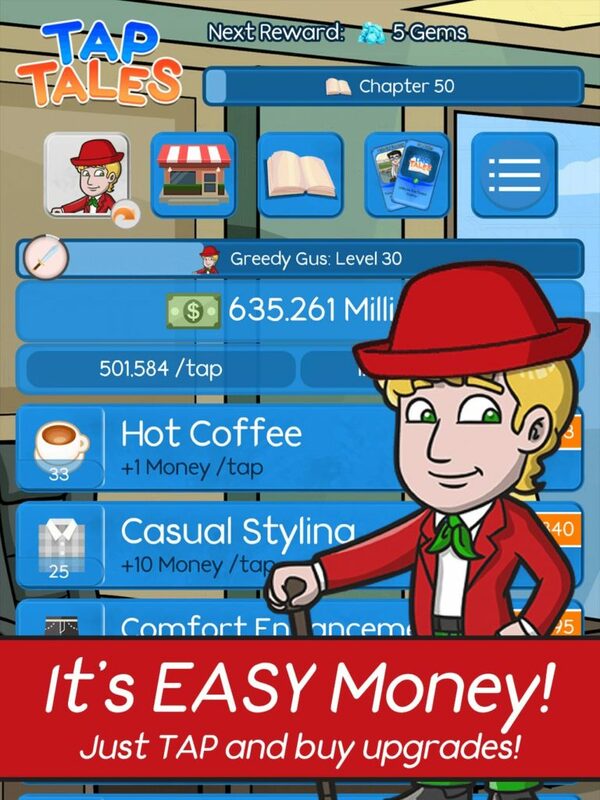 In Tap Tales you’ll become a Quattuorquinquagintillionaire (wait… how do you even say that?) and then you’ll keep multiplying your wealth until… well… I think you get the idea. In Tap Tales you’ll discover wealth far beyond your dreams as Greedy Gus, and then you’ll do it all over again with all-new characters that you’ll unlock along the way! Tap Tales is an idle clicker game – it’s really fun and easy for anyone to get into. – TAP to make money. – After you’ve bought some upgrades, you’ll start making money every 1 second. – Now that you’re making money every second, close the game and come back at any time! You’ll collect all the money you made while you were away! – When you hit new chapters you’ll unlock new cards. – Whenever you unlock a Character Card, you’ll unlock that Character! – Whenever you unlock a Theme Card, you’ll unlock that theme! – Don’t focus on just one kind of upgrade – buy them all! Quickly access different upgrades to buy, by moving left and right using the arrows on the screen. – Make sure you invest in upgrades that reduce the chance of battles occurring – this will save you time! – Multipliers multipliers multipliers! Buy any you can get your fingers on! – Don’t be afraid of the RESET button. Resetting your characters gives you Magic Scrolls which will allow you to buy powerful upgrades that make you richer, faster! Psst… just between us, have you met any Aliens in Tap Tales yet? If you have, you’re doing very well! – EASY GAMEPLAY: Anyone can play. Learn to play in about 1 minute! 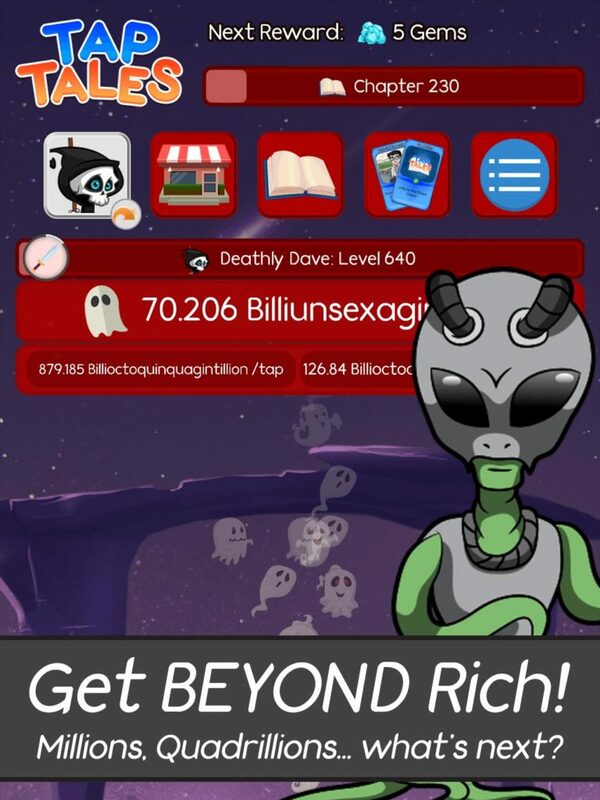 – UNBELIEVABLE WEALTH: What’s the richest you can become in a game without limits? – IDLE GAMEPLAY: Collect your income even when you’re not playing! – CHARACTERS: Unlock new characters to play as and find new wealth! – TONS OF CARDS: Can you collect all 40 unique cards? 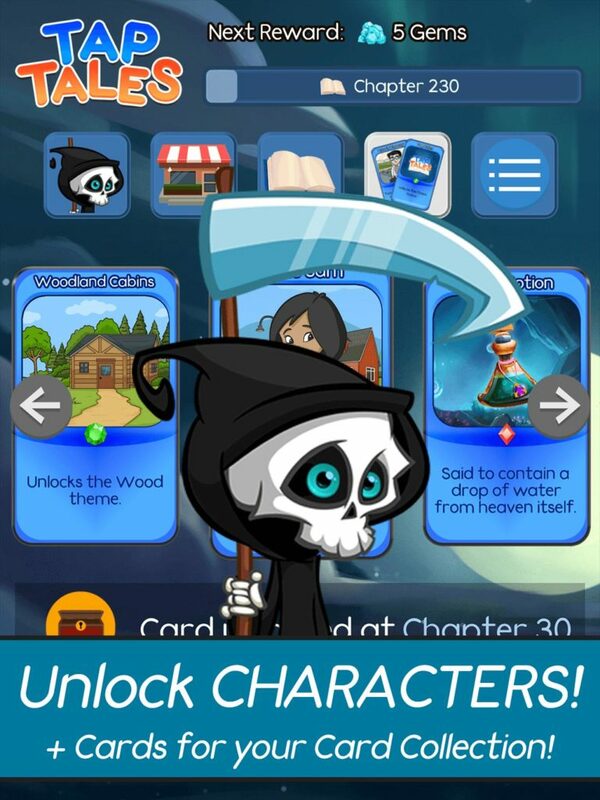 – PICK A THEME: Change the look of Tap Tales with unlockable themes! – SAVE YOUR DATA: You can save your progress from multiple devices with a free (and optional) Play Town account. – NO INTERNET REQUIRED: Play with or without an internet connection. And it doesn’t stop there… in upcoming releases of Tap Tales, you’ll be able to play as new characters, enjoy new themes, collect even more cards and get new upgrades! Joe’s lifelong dream is to make games; games that people love to play! While the mobile industry boomed, Joe was developing websites and working for his company New Alpha Media – but his passion for games made him test his skills in making games. After teaching himself how to build mobile games he managed to release Tap Tales, a game backed by his online service Play Town. He then went on to release version 2 – a complete remake of the original with huge improvements. With many lessons behind him, he knows there’s still a lot more he can (and will) do – all with your support! This article was Published by Edamame Reviews, Written by New Alpha Media.